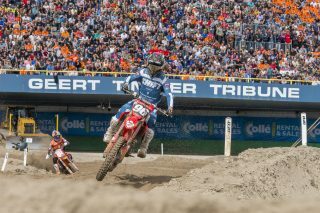 The Assen road-racing circuit in the Netherlands hosted the penultimate round of the 2018 motocross world championship, with Honda riders showing plenty of speed across all three classes. 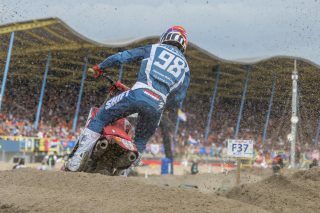 Tim Gajser and Calvin Vlaanderen both narrowly missed out on podium spots, while Hunter Lawrence led some of the first MX2 moto on this tricky sand track. 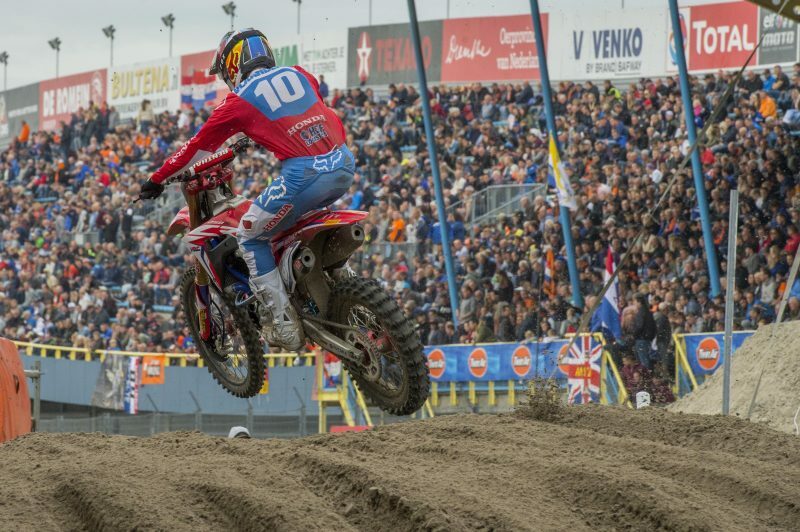 In the EMX250 class Steven Clarke, Mathys Boisrame and Alberto Forato put their pace to good use by helping Honda to win the EMX250 manufacturer championship which was the perfect ending to a season which saw Boisrame win the rider classification on board the 2018 Honda CRF250R. 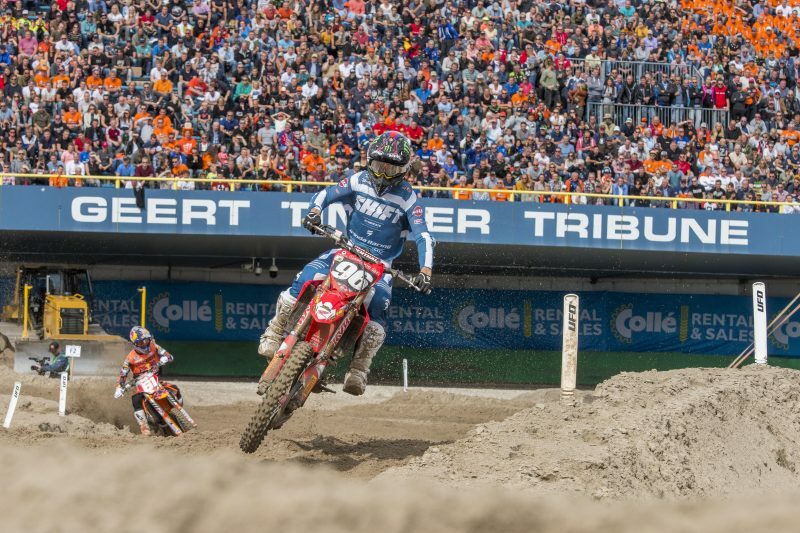 Despite being first and second fastest in timed qualification Team HRC’s Calvin Vlaanderen and Team Honda 114 Motorsports’ Hunter Lawrence weren’t able to translate their speed into the results they deserved. 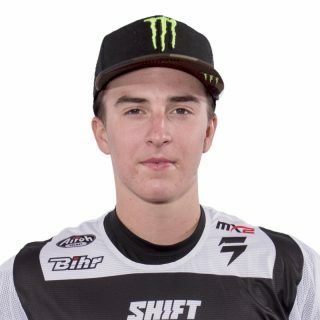 For Vlaanderen, a second place finish in the second moto looked to have been enough to have secured a podium spot but a late race crash by another rider changed things around and instead he missed out by just two points. 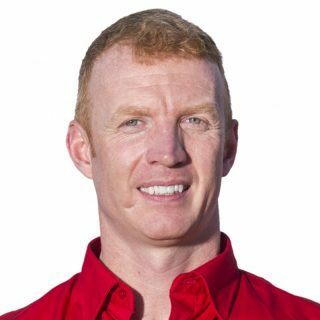 Lawrence can also feel disappointed because the Australian rider actually led the first moto after making the pass for the lead on the fourth corner. Unfortunately a few laps later he misjudged the treacherous track surface and crashed, eventually finishing the race in sixth place. 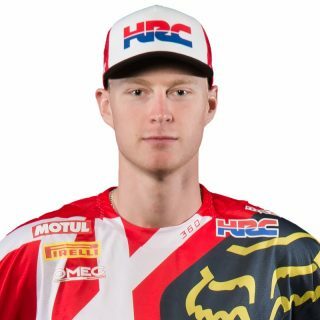 Another good start on board his CRF250R in the second race gave him a great chance to redeem himself but a mistake in turn two dropped him down the field and any chance of a podium went with it. The series now takes a weekend off before the final round of the MXGP and MX2 seasons, which will be held at the Imola circuit in Italy on September 29 and 30. Assen is over and I’m actually leaving in a happy mood, even though I’m obviously a little disappointed at not finishing on the podium. Fourth overall is not something we can complain about. I struggled a little to find the rhythm in the first race as I was chasing Ben Watson; I tried to pass him, but I simply couldn’t make it stick. 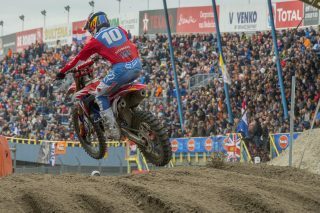 Seeing Jeffrey Herlings winning the title gave me a lot of motivation heading into race two; I had good speed and flow so I was happy to finish second. I would like to thank the team and my crew especially, and now we can get ready for the final GP at Imola! 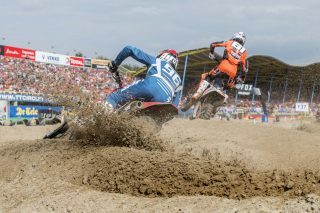 My speed was a lot better than the last sand race in Lommel, but the results really don’t do my riding level justice. We were second in timed qualifying but I couldn’t capitalise on that because I got caught up in a first turn crash. I got back up to ninth and felt good about my riding. And then today, I was third in warm-up and then the first moto started off really good. I got an awesome start on my Honda CRF250R, ending up second around the second corner and then on the fourth turned I made the pass for the lead. I was leading for the first few laps and that was great but I chose a bad line and got passed and then when I pushed to try and get back past him, I made a mistake and that cost me. The second moto I made another stupid mistake in the second corner and another great start and that meant I had no chance of a good result overall. It’s disappointing but I’m keeping my head up for the final round where hopefully the results will be much better. 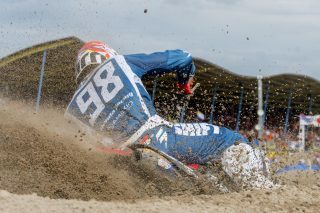 In MX2 the pace was great from Calvin Vlaanderen and Hunter Lawrence. They were first and second in timed practice and then in the races, Hunter led race one but suffered a crash and then suffered another crash which really hampered his final result. Calvin in race two was superb, he got himself into second position after passing several riders and pushed hard to try and catch up to the leader. 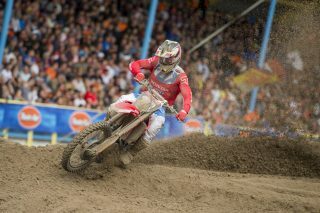 He finished second in the moto, which was a great ride and showed his skills in the deep sand.